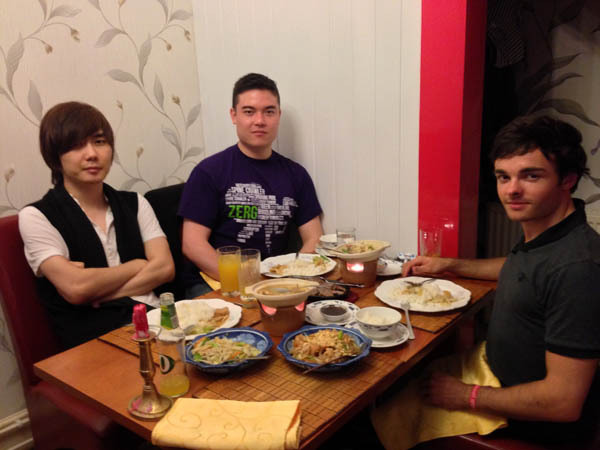 I’m sure I’ve said this before but it is massively nostalgic for me when I attend an i-Series event, because all the way back in 2012 (which in eSports timelines is approximately forever) they were who gave me my first opportunity (well, an arranged one anyway!) to showcase myself as a commentator. 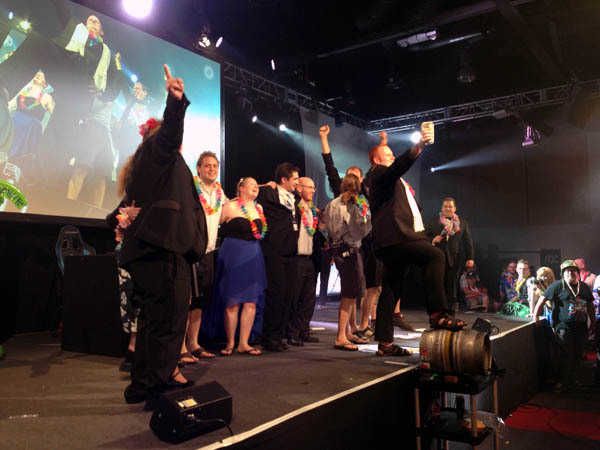 Insomnia 49 was also the biggest i-Series to date and really brought together so many different gaming disciplines under a single roof, including the huge MineCraft Expo event. 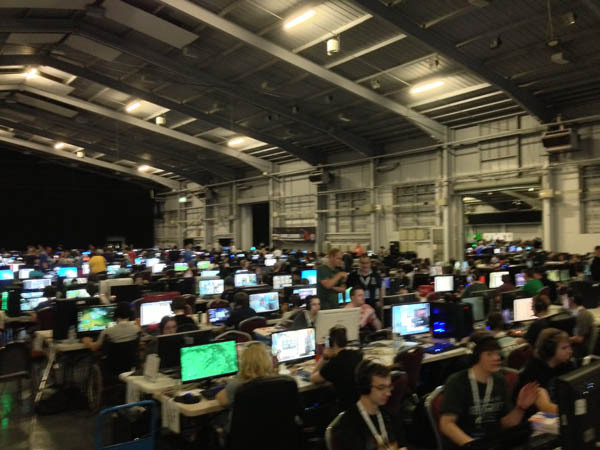 All in all, over 25,000 people descended upon Telford throughout the weekend – and unlike a lot of large scale LANs, this is an event that I can legitimately say is a proper gaming festival. 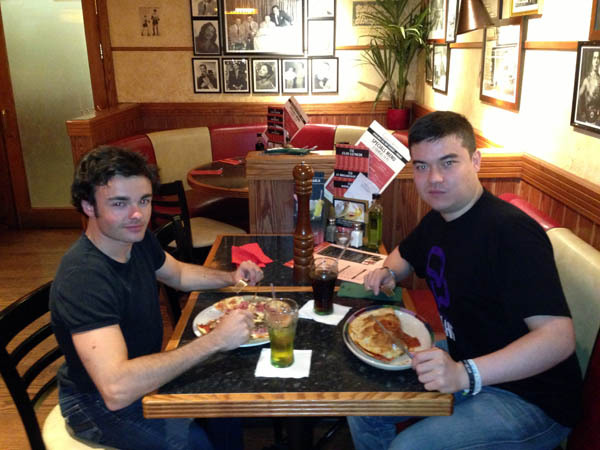 Dinner with Madals the night before commentary started – can’t go wrong with a hearty Italian! Massive shoutout as well to Matthew MacDonald a.k.a. 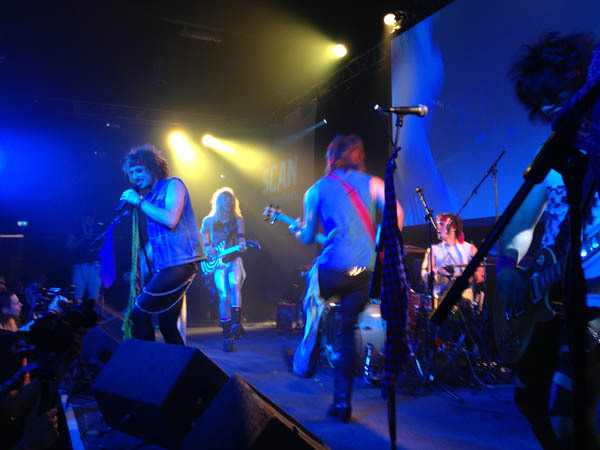 Kharne who brought in the Saints of Sin to play to the crowd on Friday night – and to be frank, not only did they attract a large crowd but were unbelievably good as well. Fantastic music (specifically great original songs combined with amazing covers of older classic tunes) coupled with good drinks – there were Starcraft, LoL, DotA, Counter-Strike, Infinite Crisis, Minecraft, TF2 folks and more all rocking out and having a great time. These guys were experts at getting the crowd going – it was amazing. I maaaaaaaaaaaay have wanted to sleep in the following morning but like a good shoutcaster, didn’t. Now, it would be impossible (sadly) not to mention some of the technical difficulties we had, especially on Friday/Sunday where for some portions of the day the internet and indeed the UK national network (i.e. the guys that supply ISPs!) was struggling to cope with the sheer number of nerds out in our little neck of the woods. Happily though these got eventually resolved – I wonder what would happen if next time something like that happens we put a sign up telling people where to tweet for customer support ;-) Kudos to Madals for coming up with that idea. Friday was reserved for casting WCG where I also laddered when there were any issues with the upload / stream, and Saturday was the beginning of the tournament with the BYOC qualifier well and truly under way. This determined the players who would be joining their seeded counterparts in Sunday’s playoffs and the games were generally extremely exciting with lots of long, macro back-and-forth action. 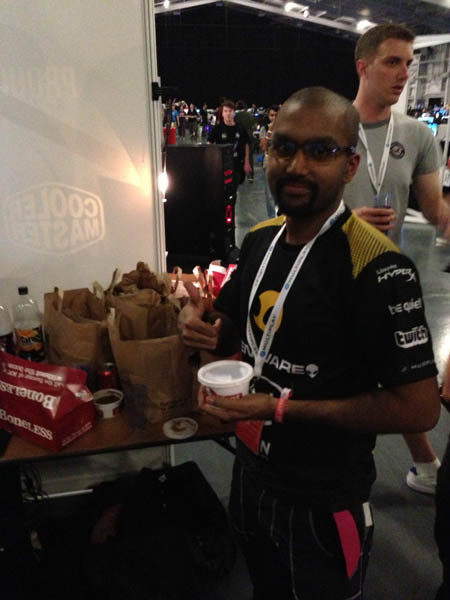 Keeping an entire team motivated to do well and practicing throughout a weekend can be tough though, and here you can see dignitas.r2k doing his best to keep the team fed and watered. Apparently, this broke the till at the branch he visited – not entirely a surprise. 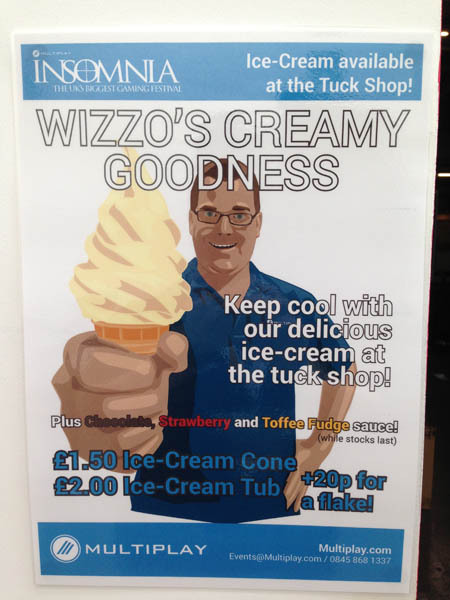 For dessert, Wizzo was on hand with the famous Multiplay ice cream machine, as well as getting creative with his advertising. Whatever he did, it worked – there were queues throughout the entire weekend! The entire time we were casting on both the Friday and Saturday as well, Madals and I were using some specialist equipment that we wouldn’t normally get to use and I’d like to touch on this a bit and why it’s so great. 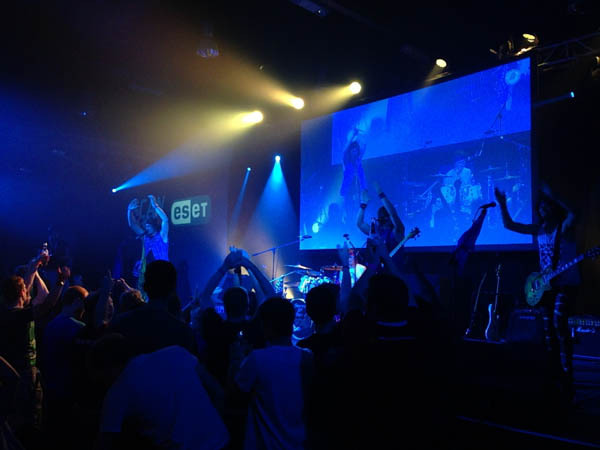 Plantronics were also on board in addition to the continued support and sponsorship of ESET for this i-Series, and provided us with the rather awesome and top-of-the-range GameCom Commander headsets that we cast from for the duration of the weekend. Now, I’m not just saying this because they sponsored the tournament – there is a really good reason why these were particularly useful throughout the weekend. Very few headsets actually come with a built in condenser microphone, allowing for good sound quality on a broadcast without having an additional standalone mic. 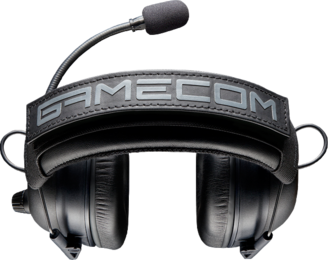 The over-ear cups of the GameCom Commander coupled with the mic quality meant that our technical setup to broadcast the tournament was much simpler without relinquishing any quality to a standard headset mic – something we really appreciated. I have to say that despite early reservations about the weight of the headset I was nowhere near as tired after wearing it for nearly eight hours as I thought I would be. I found that for prolonged sessions detaching the velcro piece at the top (thanks Madals for discovering this!) allows for a more comfortable wearing experience which meant that despite it being a hefty unit, we wouldn’t worry about fatigue towards the end of the day. This could potentially be really useful for streamers who want the flexibility to use both a good pair of over-ear headphones but have a good quality mic which can also be used on-the-move / travelling. 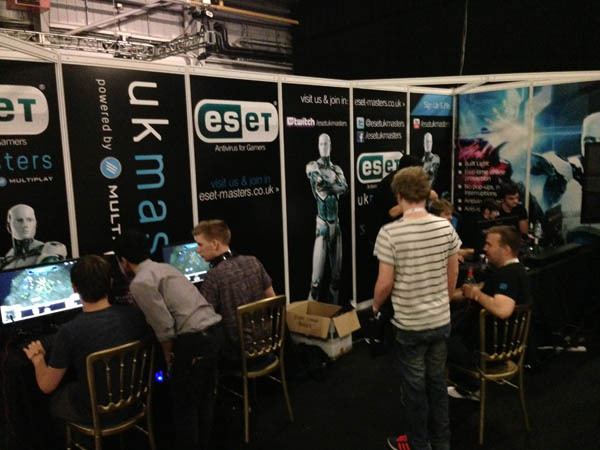 Lastly, I also wanted to highlight the genuinely awesome way Plantronics supported the ESET UK Masters Season 2 and brought in great community spirit to the i49 qualifiers – rather than just throw money at these online qualifiers (although the prize money was there!) 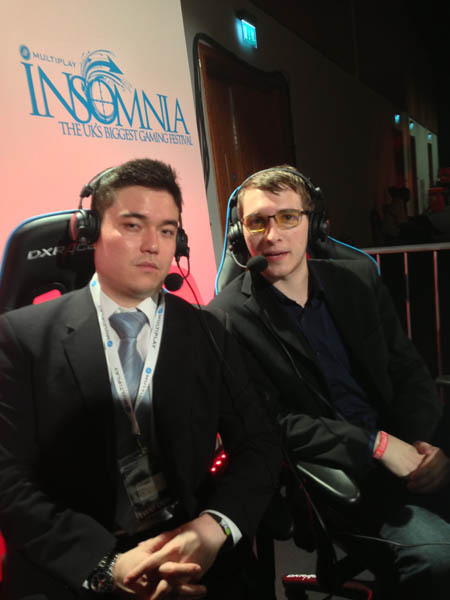 the direct UK qualifiers earned themselves headsets – a GameCom 780 for 1st-3rd and a GameCom 380 for 4th-8th. This meant that players outside the top few seeds also got prizes and help spread the joy amongst the consistent UK scene that perhaps aren’t as well known yet but are fast improving. :-) I hope that more sponsors around the world do this to support eSports in the future, it’s a fantastic way to making these tournaments not only more rewarding but potentially more accessible! 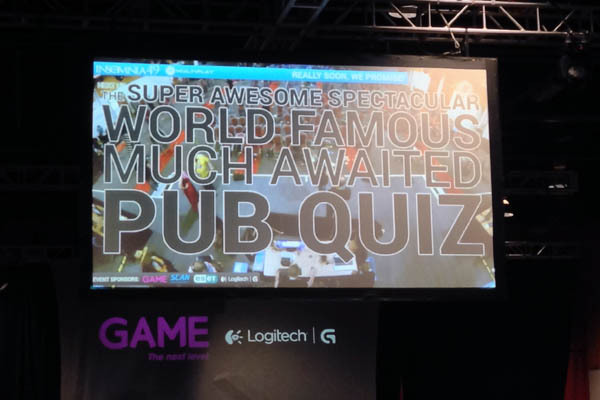 Now, Saturday night was the legendary Insomnia pub quiz – which never fails to produce a crowd that is short of capacity and entertainment that is practically unrivalled amongst fellow nerds. This year was no exception, and the atmosphere was AMAZING. I will do my best through the next few photos to give you a glimpse of what it was like, but there are some things (like the rowdy banter, the not-always-PG-friendly things that come up on-screen during the pub quiz and the always-trolling audio and video crew) that need to be experienced in person. 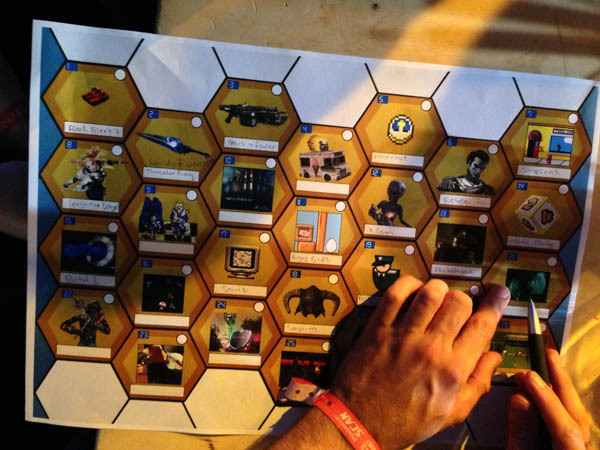 As always, a great gaming theme dominates the pub quiz and one of the most challenging turned out to be the picture round, where most teams know a lot of the games referenced but there were a few that seemed to elude almost everyone in the room – can you spot the references below? The eventual winners amassed an incredible score and also celebrated with one leg on a keg – which I have to say is particularly impressive (and also possibly quite normal for an i-Series pub quiz). There was also a bikini-clad Super-Meat-Boy Speedrunner and SC2 Caster coming in at third place (which I will spare photos). Sunday was nothing short of incredible, in a number of ways. I suppose the first of these could be waking up and getting to the venue despite sounding like Barry White with a throat infection, but a good breakfast goes at least a little way to sorting that out! The bracket stages were fantastic though, watching the players come through after group stages and in particular our finalists Harstem and BlinG make it through as the two favourites, but not before fighting through incredibly difficult competition including JonnyREcco who once again displayed his rivalry with BlinG by fighting an epic Best-of-3 where he went (only just!) to the lower bracket, later to be taken out by Harstem en-route to the final. 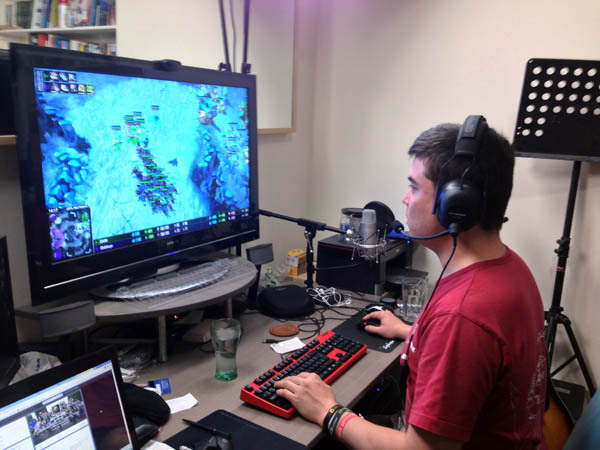 You can watch the finals by clicking this link or playing the video below – I will not spoil it game-by-game for those who didn’t watch suffice to say it was one of the most entertaining PvP’s I have cast in a very long time – I highly recommend watching! There isn’t too much to say after this other than to say the night afterwards was long and full of cheer (not just a code work for drink). It was sad to finish the games especially after a brilliant finals but a fantastic finish to top off a great weekend is never a bad way to end things. All in all, a great weekend to catch up with old friends, see and meet new faces, and watch an army of gaming enthusiasts enjoy their favourite games whatever they may be. I can’t wait until i50!